My husband and I got the opportunity to attend one of the hottest events of the season, maybe of the year. Some of the reasons it was so unique was because of the location, it’s exclusivity and it was a first time event! We had such a great time that I want to share some of our experience with others. Here are my tips on how to have the best time at Dining on the Dam. This post is sponsored by the Lexington Chamber of Commerce. All opinions are my own and based on my own experience. Thank you for supporting the communities that support this blog. Dining on the Dam was on Lake Murray Dam, overlooking the beautiful lake. They shut down one side (the side going in to Lexington) for the event and kept the other side open for one way traffic. The event was from 5 PM to 9 PM. And trust me, you want every minute of that time to enjoy the breathtaking views of Lake Murray at sunset. Watching the sun go down over the lake, while casually sipping wine and sampling delicious food, was truly magical. 72 Coffee Co. was mixing up drinks. How cute is this coffee truck?! Speaking of food, the set up was kind of buffet style, but more like beautifully presented mini-meals at each tent. On the menu was your traditional southern comfort cuisine: fried green tomatoes with salad, chicken and grits, pork and rice and catfish with collards. Yum! Pork and rice, just like grandmommy’s! I mean, can ya get a better view with some fried catfish and collards? Southern Way Catering did an amazing job with all the food. Ah-mazing. There was a dessert table (more on that later). And tons of drinking stations. Each meal tent had its own wine and then there were two huge tables with any beer, wine or liquor you could possibly want. That Murray Collins was hands down the best drink at the event! And it had pretty little flowers in it!! The Reggie Sullivan Band played live music, current and classic covers, as well as some originals. Which was phenomenal! They kind of reminded me of Maroon 5 but cooler. It was so fun watching them play in the middle of the event, overlooking Lake Murray. So beautiful! We ate. We danced. We made friends, it was truly a wonderful time. Now, here’s how we managed to pull it off without being stressed or overwhelmed! 1) Get tickets (so you can go)! Everyone I talked to, either at the event or after the event, said that they didn’t even know about Dining on the Dam. They either got tickets because someone else got them for them (or told them about it), or they simply missed out because by the time they heard about the event, all the tickets were sold out. The absolute best way to know when ticket sales are happening (before any event) is to follow that event’s page on all social media channels. One of the first skylines of Lake Murray Dam. The news also apparently leaked some info about this particular event before ticket sales were even open, so maybe keeping an eye on your local news channels/radio would be a good idea too. And of course checking Eventbrite regularly or even signing up for their newsletter, to know when the newest events in your area are posted. Some events will sell out over 6 months in advance, so keep a watchful eye! If you’re not one of the first to jump on those tickets, they will sell out before you even know they’re on sale! So doors opened for the event at 5:00pm. We were planning on getting there by 4:30pm, but it ended up being around 4:50pm by the time we parked and were walking somewhere. They had a shuttle from parking to the event, which was awesome, but a lot of people were arriving at the same time. We got on the bus first, directly from our shuttle, but some had to wait till the next bus. And when we got to the event there were already a ton of people there. By 6:00pm, it was packed. If you don’t want to spend precious time waiting for shuttles and riding buses, I would say arrive at least 30 minutes early, maybe more if you can manage it. The timing ended up working perfectly for us, but if we were any later, I don’t know that I could have said that. And that is of course no fault of the event, just the nature of large groups and seating capacity. The check in process was actually very seamless and efficient (especially for a first time event). This tip is actually from me and a couple people, but for different reasons. Look at all those darling desserts! I saw these delicious pastries and desserts while we were walking to find one of the main courses. I had to get a picture, so I figured while I was there, I might as well grab one. I don’t adhere to the “dinner before dessert” rule anyways. But, I know several people wanted desserts and walked by the table thinking there would be some left but fter dinner and there wasn’t. They were gone. The table was empty. That table did end up having some sweets later that night, but if you had already left, you would’ve missed out completely. So if you see something you like or want, get it. Because you don’t know if they will run out or how far apart they are spacing everything. You paid for it, so you might as well enjoy it while you can! If there is a certain dish or course that you loved, and they are still putting food out, get some more! These were my favorites! Fried green tomatoes with salad and 72 Coffee Co. Gin & lavender drink. Kind of like I said above, you paid for it, you might as well get your money's worth. If there was a dish that you absolutely loved, go back and get seconds. I am usually a very introverted person. Especially when it comes to big events where I don’t know anybody. We met a lovely couple waiting for our shuttle (and riding with them on the bus) and then we sat down at a random table and made friends with the couple that was sitting there. It’s funny because the couple we sat down with, was actually there with their whole family. So there were six of them! We ended up just tagging along with their group for the rest of the night and instead of maybe making two acquaintances, we made even more friends! Don’t be afraid to get out of your comfort zone and actually meet and talk to new people. I hosted a giveaway for this event and Ashleigh was the winner! The worst that could happen is they’ll be acquaintances that you’ll never see them again. The best that could happen is you make some new best friends. I’m so glad we sat down at that table and took a chance on finding new friends! If you’re anything like me you take a million pictures no matter where you go. But if you’re not, I would highly recommend taking pictures at Dining on the Damn. The scenery alone calls for many photo ops, but also the event itself. There were hanging lights, pretty displays of food, beautifully dressed people, an amazing band… the list goes on. Gorgeous set up (and food) by Southern Way Catering! Don’t forget to take some pictures. Plan on it! I am not usually a dancer, especially at events I don’t know anybody. I just feel awkward and like everybody is staring at me. Which still might be true, but just live a little! I was kid free, at an amazing event with my husband, all my new friends were dancing, so I just went for it! And you know what, I had an amazing time. The band was fun and just made you want to get out there and dance the night away. It’s OK if you look a little crazy, no one will remember the next day or you’ll make one heck of a party story! I am not suggesting this because I felt I was dressed uncomfortably. My shoes were the right height, my dress was long and the perfect fabric for the weather. I’m sharing this tip for the people who maybe didn’t dress accordingly. You are literally walking for the whole event. Yes there are seats and railings for you to lean up on, but do you really want to be uncomfortable at an event like that? It’s not a gala, so you don’t need to dress to the nines in full cocktail attire. I would say it’s mainly dressy casual. There were people in jeans, there were people in nice dresses, there were people in suits, there were people in what looked like workwear. Don’t think too much on it. Just be comfortable and weather appropriate and you’ll be fine! Some people asked if you could tell that it was a first time event. I would say no. It was epic and wonderfully organized. But there were definitely a lot of people there. Maybe too many for the amount of space available. Less tickets might be something worth looking into for next year’s event, which would make it more exclusive. We also got our event souvenir cup at the very beginning. It makes sense, “free” advertising for the event and a cool gift. But that also means you have to carry it around all night. It would’ve been nice to get it at the end of the night and not risk getting it mixed up with someone else’s or losing it. I haven’t personally been to the Gervais Street Bridge Dinner, but I understand one of the differences was that it was a sit down dinner and you were served the courses. That would definitely ensure everyone gets to sample everything at least once. That also means you’re not standing around waiting in lines. I would’ve really appreciated a designated “picture spot”. Maybe even an event worker there to help take pictures too. You kind of just had to fend for yourself and find a good spot. It would’ve been a nice extra touch. These are just some of my personal thoughts. No event is ever 100% perfect. And for a first time event, I say it was pretty darn amazing! Want to go next year? Make sure you follow their evet pages on Facebook & Instagram for all their upcoming info. 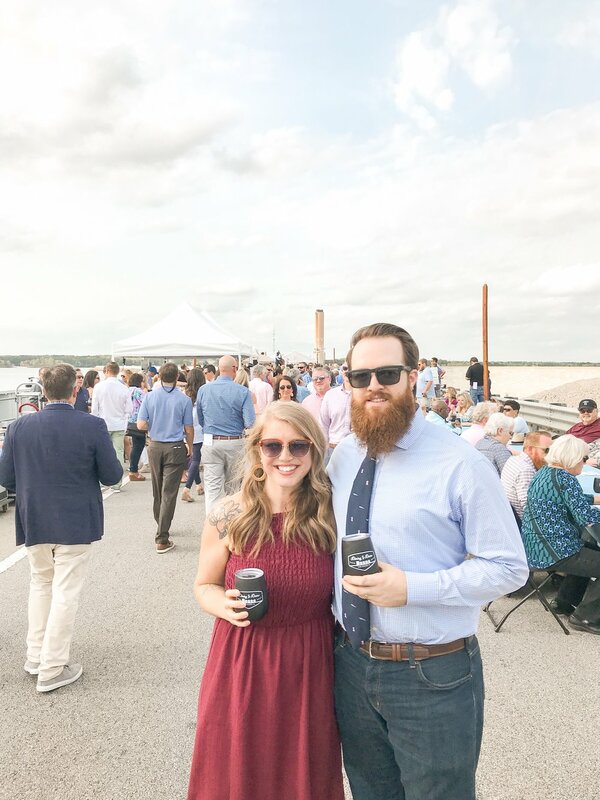 Did you get to go to this year’s Dining on the Dam? I would love to hear your thoughts in a comment below!